A serious cry (mostly from men) rang out through the city one hundred years ago about the ever-expanding transit system and the scandalous style of women’s skirts. Were frocks getting caught in doorways? Were dress lengths causing women fall down stairs? Perhaps, but that wasn’t the issue. 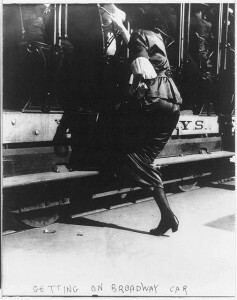 The latest fashion trend, the hobble skirt, was slowing the progress of women onto and off of streetcars, causing frustrating delays. After a millenia of unfettered skirts, this new silhouette must have seemed positively strange to elder fashionistas. Aesthetics aside, the hobble skirt created a practical problem. While measured, graceful walking might be fine on Ladies Mile or strolling along Fifth Avenue, it was an encumbrance upon the ever-moving streetcar system. 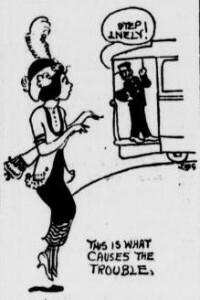 An executive of the Interborough Transit System (New York’s first subway operator) grumbled to the Evening World in 1912 about the extra burden the hobble skirt created upon city transportation and called for the fashion trend to be abolished. “Often hundreds of people will be forced to stand aside patiently waiting for some women to raise her skirts sufficiently to allow her to step into the car,” said George Keegan, general superintendent. A special ‘step-less’ car had even been designed with the fashionable lady in mind. The first of these “hobble-skirt, hygenic, fool proof” cars debuted on the streets of New York in the spring of 1912. Meanwhile, underground, fashionable ladies were finding difficulty clearing the gap between the platform and subway cars. “Nearly all of the accidents in the subway are due to the fact that women wear hobble skirts,” said Keegan, a claim which could not possibly have been true. The Pennsylvania Railroad, fearful of complaints and potential lawsuits, acted upon the crisis the following year by requiring train conductors to note skirt styles and “height of heel” and report all data to their central office. 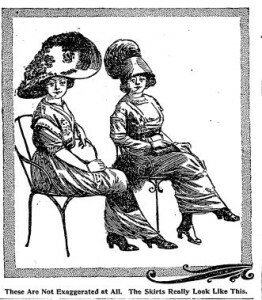 “If women passengers on the Pennsylvania Railroad insist on wearing such mantraps, or rather womantraps, as hobble skirts and high heels they cannot hold this company responsible for accidents which may happen to them,” claimed the railroad. But all these railroad executives really needed to do was simply wait — trends subside, to replaced with other, more objectionable wear. But, leaving taste aside, at least you could ride the subway in a harem skirt!